^ Muir, Hazel. 'Goldilocks' planet may be just right for life. New Scientist. 25 April 2007 [2009-04-02]. ^ The Goldilocks Planet. BBC Radio 4. 31 August 2005 [2009-04-02]. ^ 4.0 4.1 4.2 4.3 Dole, Stephen H. Habitable Planets for Man. Blaisdell Publishing Company. 1964: 103. ^ Borenstein, Seth. Cosmic census finds crowd of planets in our galaxy. Associated Press. 19 February 2011 [2011-04-24]. ^ Redd, Nola Taylor. Greenhouse Effect Could Extend Habitable Zone. Astrobiology Magazine. NASA. 25 August 2011 [25 June 2013]. ^ 7.0 7.1 7.2 Fogg, M. J. An Estimate of the Prevalence of Biocompatible and Habitable Planets. Journal of the British Interplanetary Society. 1992, 45 (1): 3–12. Bibcode:1992JBIS...45....3F. PMID 11539465. ^ Sharp, Tim. Atmosphere of the Moon. Space.com. TechMediaNetwork. [April 23, 2013]. ^ Bolonkin, Alexander A. Artificial Environments on Mars. Berlin Heidelberg: Springer. 2009: 599–625. ISBN 978-3-642-03629-3. ^ Chow, Denise. Newfound Alien Planet is Best Candidate Yet to Support Life, Scientists Say. Space.com. February 2, 2012 [February 3, 2012]. ^ von Bloh, W.; 等. Habitability of Super-Earths: Gliese 581c and 581d. Proceedings of the International Astronomical Union. 2008, 3. arXiv:0712.3219. doi:10.1017/S1743921308017031. ^ A Habitable World After All?. Centauri-dreams.org. December 13, 2007 [January 18, 2009]. ^ M. I. BUDYKO. The effect of solar radiation variations on the climate of the Earth. Tellus: 611–619. doi:10.1111/j.2153-3490.1969.tb00466.x. ^ Sellers, William D. A Global Climatic Model Based on the Energy Balance of the Earth-Atmosphere System. Journal of Applied Meteorology. June 1969, 8 (3): 392–400. Bibcode:1969JApMe...8..392S. doi:10.1175/1520-0450(1969)008<0392:AGCMBO>2.0.CO;2. ^ North, Gerald R. Theory of Energy-Balance Climate Models. Journal of the Atmospheric Sciences. November 1975, 32 (11): 2033–2043. Bibcode:1975JAtS...32.2033N. doi:10.1175/1520-0469(1975)032<2033:TOEBCM>2.0.CO;2. ^ Michael H. Hart. Habitable zones about main sequence stars. Icarus: 351–357. [2018-04-02]. doi:10.1016/0019-1035(79)90141-6. 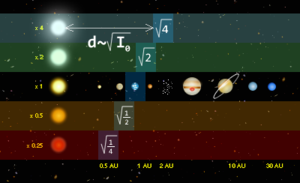 ^ Kasting, James F.; Whitmire, Daniel P.; Reynolds, Ray T. Habitable Zones around Main Sequence Stars. Icarus. January 1993, 101 (1): 108–118. Bibcode:1993Icar..101..108K. PMID 11536936. doi:10.1006/icar.1993.1010. ^ David S. Spiegel, Sean N. Raymond, Courtney D. Dressing, Caleb A. Scharf, Jonathan L. Mitchell. Generalized Milankovitch Cycles and Long-Term Climatic Habitability. The Astrophysical Journal. 2010, 721 (2): 1308 [2018-04-02]. ISSN 0004-637X. doi:10.1088/0004-637x/721/2/1308 （英语）. ^ Yutaka Abe, Ayako Abe-Ouchi, Norman H. Sleep, Kevin J. Zahnle. Habitable Zone Limits for Dry Planets. Astrobiology. 2011-06-27, 11 (5): 443–460 [2018-04-02]. doi:10.1089/ast.2010.0545 （英语）. ^ Vladilo, Giovanni; Murante, Giuseppe; Silva, Laura; Provenzale, Antonello; Ferri, Gaia; Ragazzini, Gregorio. The habitable zone of Earth-like planets with different levels of atmospheric pressure. The Astrophysical Journal (accepted). March 2013, 767 (1): 65–?. Bibcode:2013ApJ...767...65V. arXiv:1302.4566. doi:10.1088/0004-637X/767/1/65. ^ 24.0 24.1 Kopparapu, Ravi Kumar. A revised estimate of the occurrence rate of terrestrial planets in the habitable zones around kepler m-dwarfs. The Astrophysical Journal Letters. 2013, 767 (1): L8. Bibcode:2013ApJ...767L...8K. arXiv:1303.2649. doi:10.1088/2041-8205/767/1/L8. ^ Zsom, Andras; Seager, Sara; De Wit, Julien. 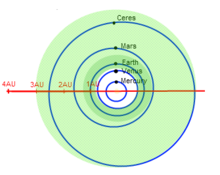 Towards the Minimum Inner Edge Distance of the Habitable Zone. 2013. arXiv:1304.3714 [astro-ph.EP]. ^ Ramirez, Ramses M.; Kopparapu, Ravi Kumar; Lindner, Valerie; Kasting, James. How close is Earth to a runaway greenhouse?. 2013. arXiv:1306.5730. ^ Cuntz, Manfred. S-Type and P-Type Habitability in Stellar Binary Systems: A Comprehensive Approach. I. Method and Applications. 2013. arXiv:1303.6645 [astro-ph.EP]. ^ Forget, F.; Pierrehumbert, RT. Warming Early Mars with Carbon Dioxide Clouds That Scatter Infrared Radiation. Science. 1997, 278 (5341): 1273–6. Bibcode:1997Sci...278.1273F. PMID 9360920. doi:10.1126/science.278.5341.1273. ^ Mischna, M; Kasting, JF; Pavlov, A; Freedman, R. Influence of Carbon Dioxide Clouds on Early Martian Climate. Icarus. 2000, 145 (2): 546–54. Bibcode:2000Icar..145..546M. PMID 11543507. doi:10.1006/icar.2000.6380. ^ Vu, Linda. Planets Prefer Safe Neighborhoods (新闻稿). Spitzer.caltech.edu. NASA/Caltech. [April 22, 2013]. ^ 33.0 33.1 Barnes, Rory; Heller, René. Habitable Planets Around White and Brown Dwarfs: The Perils of a Cooling Primary. Astrobiology. March 2013, 13 (3): 279–291. Bibcode:2013AsBio..13..279B. PMC 3612282. PMID 23537137. arXiv:1203.5104. doi:10.1089/ast.2012.0867. ^ Buccino, Andrea P.; Lemarchand, Guillermo A.; Mauas, Pablo J.D. Ultraviolet radiation constraints around the circumstellar habitable zones. Icarus. 2006, 183 (2): 491–503. Bibcode:2006Icar..183..491B. arXiv:astro-ph/0512291. doi:10.1016/j.icarus.2006.03.007. ^ Kasting, J.F. ; Ackerman, T.P. Climatic Consequences of Very High Carbon Dioxide Levels in the Earth's Early Atmosphere. Science. 1986, 234 (4782): 1383–1385. PMID 11539665. doi:10.1126/science.11539665. ^ Agol, Eric. Transit Surveys for Earths in the Habitable Zones of White Dwarfs. The Astrophysical Journal Letters. April 2011, 731 (2): 1–5. Bibcode:2011ApJ...731L..31A. arXiv:1103.2791. doi:10.1088/2041-8205/731/2/L31. ^ Carroll, Bradley; Ostlie, Dale. An Introduction to Modern Astrophysics 2. 2007. ^ Richmond, Michael. Late stages of evolution for low-mass stars. Rochester Institute of Technology. November 10, 2004 [2007-09-19]. ^ Jianpo Guo, Fenghui Zhang, Xuefei Chen, Zhanwen Han. Probability distribution of terrestrial planets in habitable zones around host stars. Astrophysics and Space Science. 2009-10-01, 323 (4): 367–373 [2018-04-02]. ISSN 0004-640X. doi:10.1007/s10509-009-0081-z （英语）. ^ Franck, S.; von Bloh, W.; Bounama, C.; Steffen, M.; Schönberner, D.; Schellnhuber, H.-J. Habitable Zones and the Number of Gaia's Sisters (PDF). (编) Montesinos, Benjamin; Giménez, Alvaro; Guinan, Edward F. ASP Conference Series. The Evolving Sun and its Influence on Planetary Environments. Astronomical Society of the Pacific: 261–272. 2002 [April 26, 2013]. Bibcode:2002ASPC..269..261F. ISBN 1-58381-109-5. ^ Cowen, Ron. A Shifty Moon. Science News. 2008-06-07. ^ Bryner, Jeanna. Ocean Hidden Inside Saturn's Moon. Space.com. TechMediaNetwork. 24 June 2009 [22 April 2013]. ^ Rogue Planets Could Harbor Life in Interstellar Space, Say Astrobiologists. MIT Technology Review. MIT Technology Review. 9 February 2011 [24 June 2013]. Charles H. Lineweaver, Yeshe Fenner and Brad K. Gibson. The Galactic Habitable Zone and the Age Distribution of Complex Life in the Milky Way. Science. January 2004, 303 (5654): 59–62.